I hope this email finds you well. I wanted to thank you again for agreeing to the discount on the Super Imploder and give you an update on my findings so far. I bought two identical plant packages and used the imploder water on one and tap water in the other. The first thing noticed was that the imploder water absorbed the soil in about 1-2 minutes, leaving the soil looking moist & fluffy and the tap water absorbed the soil after about 30 minutes. Even after 40 minutes the tap water Was not completely absorbed and made the soil into a sloshy mud. Both plants are placed in the same soil, same sized pot and in place in the same sunlight. The only difference between the two is the water. Tap : no significant change in growth. Looking a bit more brown. Imploder: immediate noticeable growth of 1/4" - 1/2". Plant is noticeably greener , straighter and has a new patch of red on the stock. Tap: growth of 1/4-1/2". still has some brown color. Imploder: growth Of 1". Vibrant green color. Tap: growth of 1". Slightly greener but still has some brown coloring , new red patch on stock, growth of two new stocks sprouting On the base. Imploder: growth of 2.5". Two new stocks spouting from base. Bright green and much straighter than the other. So far the the plant with the imploder water has double the growth compared to the tap water plant. Very impressive ! I have been taking pictures to document the results and here they are. 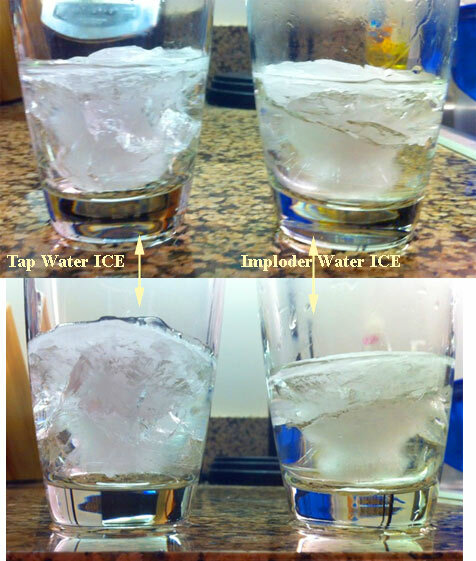 I also froze two cups if water to see if the water looks different and the imploded ice had fewer cracks, less lines, and was noticeably clearer. In the bath the water has a "silky" feel to it very similar to how conditioned "soft water" feels. Soap, shampoos and hair conditioners are more effective and skin is noticeably softer. The imploded water also does not bead up on the skin like tap water and appears to be absorbed more efficiently by the skin. The smell of chlorine is removed and tastes much better. It's almost as if your body is saying"Yep... That's the stuff I like". Tea and coffee Taste much much better. The flavor of the tea comes through the water and you can even taste the individual favors if each type of leaf but the coffee is what really blew me away. The coffee tastes much smoother and much less acidic. Honestly I would recommend that someone purchase an imploder if it was only for this one reason ......tasting The worlds best coffee. Another thing that I do not know how to document but thought it is definitely worth mentioning is that after drinking the imploder Water the first night, I felt like I had much more energy and I woke up much earlier than normal because I had so much energy. Even with less sleep I felt more awake and clear headed the next day. Just looking at the difference in the two plants really makes me wonder what a huge beneficial difference it would have on humans. Do you have anything in the pipeline (sorry I couldn't resist the pun) for agriculture or other markets?